Porcelain veneers are thin, tooth like shells that covers the front and sides of the tooth. These delicate restorations are unbelievably strong and provide both a conservative and natural looking enhancement to your smile. We follow a four step smile design process for porcelain veneers. This process begins with a comprehensive evaluation to examine your teeth, gums, mouth, jaw joints and muscles. Next, we use 2-D and 3-D imaging to simulate the proposed results of the treatment, allowing you and the dentist to visualize the outcome and test its function. Next, we create interim replicas, also called provisionals, of your final porcelain veneers. You will have the opportunity to wear the temporary teeth veneers to make sure you are happy with the look and feel. Copies of the provisionals are made and then sent to a dental laboratory where the porcelain veneers will be hand crafted. 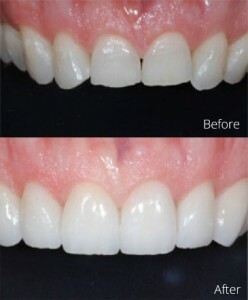 The final porcelain veneers will be permanently bonded to the teeth, gently polished and adjusted for color if necessary. With porcelain veneers, your teeth will appear brighter, whiter, straighter and more beautiful. Our goal is to create a smile that compliments your face and looks like it was supposed to be there. Virginia Family Dental offers comprehensive dental care including porcelain veneers. For more information, call today at (218) 741-0405 to schedule a consultation with one of our dentists.